A perfect soup for all seasons topped with a fresh herb pesto. Heat oil in a deep frypan and gently saute vegetables for 5 minutes or until just softened. Add water and CONTINENTAL Professional Gluten Free Spring Vegetable Soup Mix and bring to the boil, stirring continuously. Simmer for 10 minutes. In a food processor blitz basil, macadamia and parmesan until roughly chopped. With the motor running slowly add olive oil and continue blitzing until fully combined. 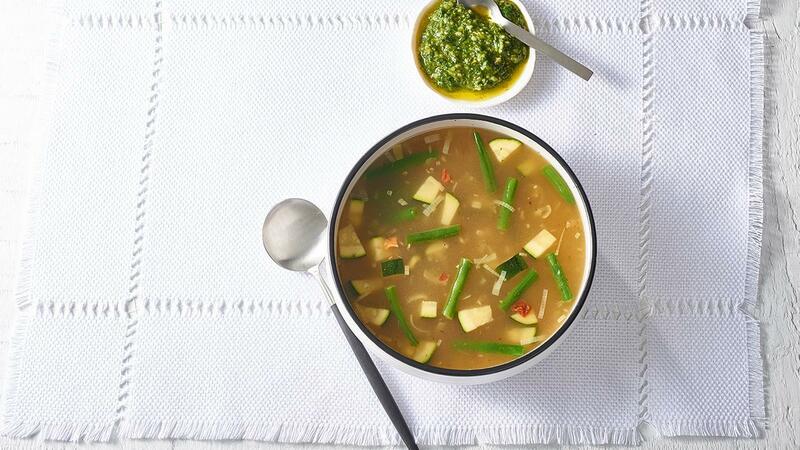 Serve spring vegetable soup topped with pesto. Make sure you use vegetables that are in season to keep your costs down and ensure only the freshest and most flavourful ingredients are used.